Sports photographs taken for Bates College, The Baltimore Sun, The Daily Hampshire Gazette, Messenger Post Media, and for personal work. UMASS Amherst's Eric Filiou skates through ceremonial smoke before a game at the Mullins Center in Amherst, Massachusetts. 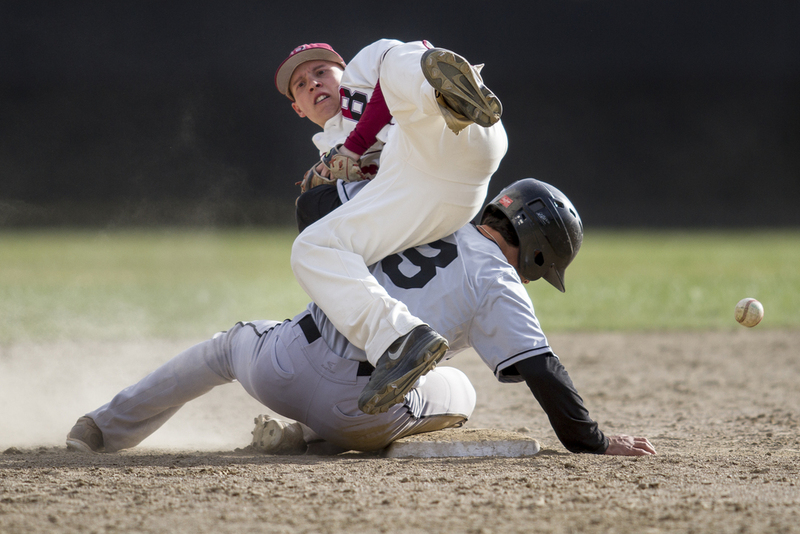 Bowdoin breaks up a double play as Bates shortstop Brendan Fox '17 loses the ball. Rochester Institute of Technology's Christian Blank muscles through several Paul Smith's College defenders during the school's first Rugby match in 5 years. Hammond High School's John Mbah displays the results of an unfortunate meeting of his mouth and another player's cleat at preseason football scrimmages held in Blandair Park in Columbia, Maryland. Ayden Haddad navigates through the garbage accumulated underneath the bleachers at Canandaigua Motorsports Park in Canandaigua, New York. The Chicopee Comprehensive Colts prevailed 16-14 over the Amherst Hurricanes in Amherst, Massachusetts. Severna Park Senior Defender #18 Nathan Bayles leaps up in victory after the 2013 Class 4A boys soccer final at UMBC. Severna Park edged Blake for a 1-0 win. 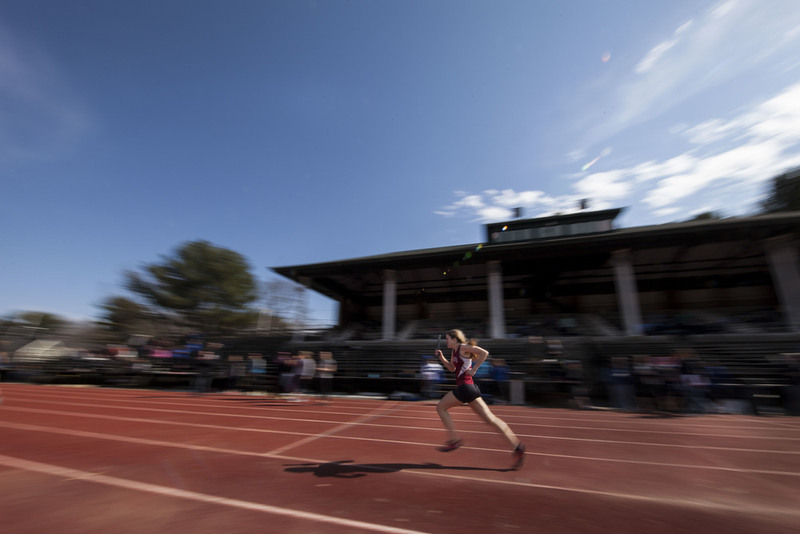 Ashley Pollack '17 speeds through her leg of the relay. South Hadley's Chris Rojas tries to keep Granby's Clayton Yarneksy from flipping over during their match at Granby High School in Granby, Massachusetts. 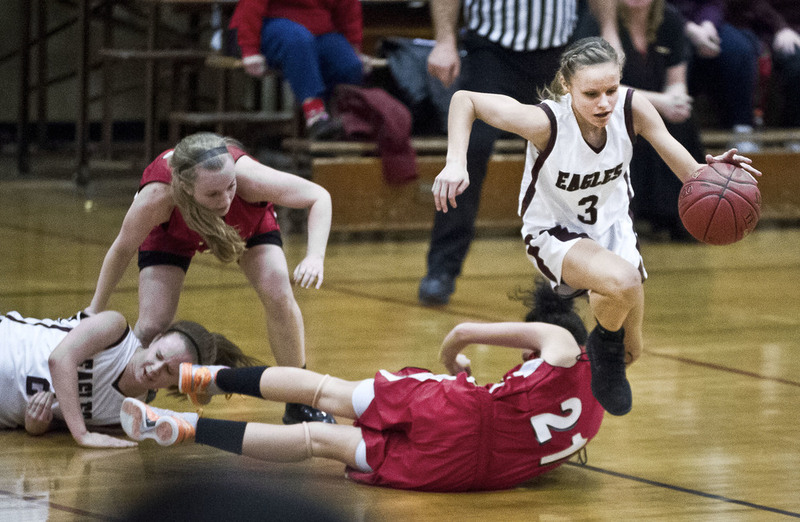 Easthampton's Courtney Urban breaks away from trouble against visiting Athol in Easthampton, Massachusetts. The Bates Men's rowing team rests on the Androscoggin River after a race. Pittsford Junior Wide Reciever Glynn Molinich recovers during halftime with his teammates before going on to shut out opponent Edison Tech 42-0 in Rochester, New York. Hall High School's Ethan Swain takes one last stroke during the 100-yard Butterfly against Wethersfield at the Cornerstone Aquatic Center in West Hartford, Connecticut. Shaun Carroll '16 holds up the CBB (Colby-Bates-Bowdoin) Championship trophy his teammates fought to retain after Bates' 31-0 win over Bowdoin College. Breakaway Roping at the Cody Rodeo in Cody, Wyoming. Darrius Campbell '17 maintains focus at the Bates Squash Center. Zachary Collester '19 approaches the finish of the 100 backstroke against Trinity at Tarbell Pool. Marcus Delpeche soars for one of his four second-half dunks in Bates' 67-63 loss to Southern Vermont. Patrick Sheils '19 of Portland, Maine eyes the landing for his flip at the base of Mt. David. The Bates Shred Club hosts "Skill 'N Grill," featuring a ski jump at the bottom of Mt. David behind 280 College Street as part of the 2016 Winter Carnival.